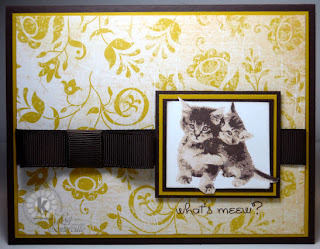 Designs by Lisa Somerville: Kitchen Sink Stamps Monday - What's Meew? Kitchen Sink Stamps Monday - What's Meew? Happy Kitchen Sink Monday! Today I've inked up the kittens from the Multi Step Kittens and Pup Set, stamping them as follows on White card stock: #4 Chocolate Chip, #3 Chocolate Chip stamped off, #2 Creamy Caramel stamped off, #1 Creamy Caramel stamped off. The image panel was cut using the Out of the Box Technique. The edges are lightly sponged with Chocolate Chip, then layered on Chocolate Chip, Crushed Curry and Chocolate Chip panels. I used a SAMJ to stamp the sentiment in Chocolate Chip on the RazzleBerry Lemonade DSP under the image. Don't forget, you can SAVE 10% on all your Kitchen Sink Stamps purchases when you use code LISA10KSS - feel free to pass it on! Do you live near Georgia? Kitchen Sink Stamps is going on a Road Trip - click here to read more! Hope to see you there! Have you entered this month KSS Challenge? You have until August 21st to enter, be sure to use KSS images on your challenge, and you could win some FREE KSS product! Beautiful colors and papers for these adorable out-of-the-box kittens! My cat-loving friends would delight in receiving this precious card!! Wonderful work, Lisa! Love these cute kittens. The background dp looks great with it. Very purrrty little kitty and love the paper you used as the background. Wish I lived closer to Warner Robins to attend the training, looks very cool. This is just sooo adorable, Lisa!! love the kittens, and the background DP is just perfect! Ohhh, just love those new colors! Great color combo for the kittens too. Perrrfect for the out of the box technique. Lisa - This card is so cute & beautiful at the same time! Love the elegant dp and brown bow tie!! Love how the kittens pop out of the box Lisa. Such great colors you chose for the card. You always do such wonderful work!